Alright well I have had enough of this and this is the time in my life that I think this problem needs to go away, not only because I am preparing to enter into a relationship with someone, but also because I am not getting as many zits as I used to. As you can see from the picture attached, my problem is quite clear, shitloads of red marks and or scars. The otherside of my face looks basicly the same though not as bad. I have tried Proactiv for about 6 monthes(this happened maybe a year ago now? ), but it pretty much did nothing. I probably poke and prod at them too much, but I look so horrible as it is now and it just frustrates the heck out of me I stopped using Proactiv awhile ago, went to using nothing, but now I daily clean my face with Dove exfoliating bar soap and for 2 weeks having been using Neosporin cream. The Neosporin I think has kinda been helping, less zits and on the weekends it does't look as red or bad as that, but during the week having to work primarily out in the sun and with dusts/chemicals and stuff it just seems to get irritated like this and become god awful. What exactly is my problem here and what can I do to get rid of it and help the situation? Thanks in advance. 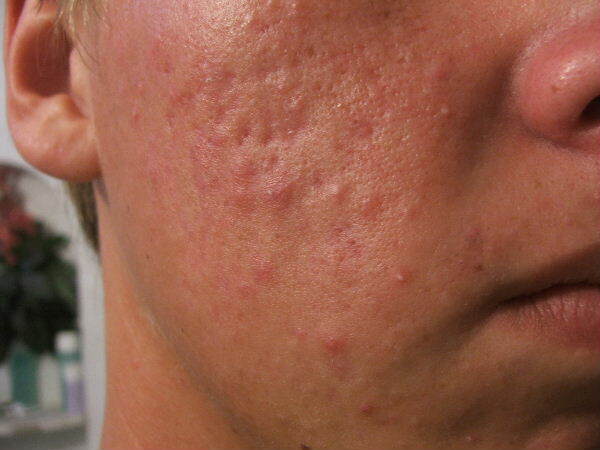 Firstly, your skin is really not as bad as you think, i know you will hear that a lot on acne.org but its really not. Red marks take forever to go away. I've had 5 vstar laser treatments for them. They have helped a ton, but they are still very noticeable without makeup. I'm thinking about having Smoothbeam which would help,too. ANyways, unless you're having some kind of laser treatment, or on RetinA or any other medication like that, you have to wait it out. There are some over the counter products from Neutrogena, Aveeno, and Eucerin which is supposed to help with red marks. I have tried Proactiv for about 6 monthes(this happened maybe a year ago now? ), but it pretty much did nothing. I probably poke and prod at them too much, but I look so horrible as it is now and it just frustrates the heck out of me Ã‚Â I stopped using Proactiv awhile ago, went to using nothing, but now I daily clean my face with Dove exfoliating bar soap and for 2 weeks having been using Neosporin cream. The Neosporin I think has kinda been helping, less zits and on the weekends it does't look as red or bad as that, but during the week having to work primarily out in the sun and with dusts/chemicals and stuff it just seems to get irritated like this and become god awful. it looks like you're sunburned and your skin looks irritated and inflamed. does not really look like redmaks. my skin looked just like that 3 months ago. It was a combination of sunburn and inflamed zits. I got it calmed down by avoiding the sun (spf does not work on me, I get red AND irritated) and stoppimg my compulsive eating. I also clean at most once a day w/ a gentle cleanser. Dove exfoloiating bar twice a day is pretty harsh, even on healthy skin, much less already inflamed skin. And even the regular dove bar is pretty harsh (I tried it once). I did better with neutrogena glycerin bar (not the acne one, the regular one). That helped. I also took aspirin twoice a day for a couple of days. But too much aspirin can be totally bad. anyway, I'm keeping a log on my own redface situation. You might not find it too helpful though cuz I'm using ortho for the zits and 30% of my "getting rid of redness" regime is staying outta the sun. Twice a day, before I go to work and after I get home. You should definately treat the active acne first, many ways to do this, for one way, check the 2nd link in my signature. Also I see people mentioning lemon water? Are you saying I should be drinking lemon water or something What is the deal with that treatment, what is it, what do I need and how do I do it? hey me3. for the diet thing, i really suggest you check out igotmyphilosophy's log in the personal regimen log forum. She does this thing, well, I'll let u read it, but she basically got her redness to calm down by 70% by the 3rd day or something. I sorta tried doing what she did (a less extrerme variation) and it really did help. If u decide to try it, all i can say, I hope ya like apples. There's like a shitload of products out there for fading redmarks, but it really doesn't look like to me that you have redmarks, just general sunburn and irritation, from the pics u posted anyway. Check out some pics in the redmarks forum, they look pretty different. This is probably a better picture of the problem so you tell me, this was taken today of course and the previous picture was taken the day I started this thread. But she's an angel for sure. She just can't stop telling lies. already caught in a trap. and she is not coming back. crashing cars in his brain. nd only she can set him free. Cuz she's an angel for sure. and only she can set him free.